I am absolutely amazed at the simplicity of this product and am in lurveeee with the Japanese aesthetic. 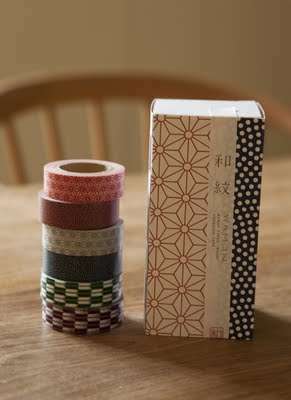 Wamon MT is one of the many Masking Tapes designed by Kamoi Kakoshi Company Limited and while all of them are equally delightful, this one in particular catches my fancy. Made from Rice Paper, this tape leaves no residue, you can write ON it and it can be used to Decorating, Packaging and Personalizing for wrapping suckers like me! I spotted the item first on a Brilliant blog/shop called None Such Things, if you’re craving a purchase, it can be ordered for roughly 20GBP.